Can you read with and/or tutor a child? Can you toss balls to a beginner? Can you rally with a young player? Can you be a court monitor for 10 & under matches? Can you document an event with photographs? Do you have other special skills? A's & Aces is only able to impact so many children each year because of the help we receive from many dedicated volunteers who help us both on and off the courts. Would you like to serve as a Volunteer Court Monitor? 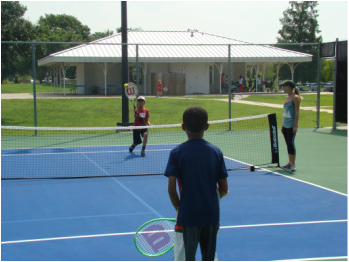 All Volunteer Tennis Coaches, Court Monitors, Classroom Reading Assistants, and Tutors must complete a Criminal Background Screening after reading the Youth Protection Policies, and completing a short Online Training Module. Read Details Below. A's & Aces will host five USTA sanctioned tournaments in 2017 requiring many volunteer court monitors, particularly for age 8 & Under and 10 & Under matches to help young players follow the rules as they learn to compete in these entry-level tournaments. If you are interested, willing and available to commit to a minimum 2-hour shift on any of the tournament dates, please click the REGISTER TO VOLUNTEER button above. We will send you information about red-ball and orange ball 8s/10s format by email, and will schedule a training session during one of our regular Saturday 8s/10s clinics at Joe Brown Park. If you have questions, please contact us at Outreach@AsAndAces.org. If you are interested, willing and available to assist as a Volunteer Tennis Coach, Volunteer Classroom Assistant and/or Tutor, please click the REGISTER TO VOLUNTEER button above. In just a few hours the Coach Youth Tennis Courses can help you change the lives of kids forever. This valuable new resource consists of a series of free online courses and an interactive, on-court workshop designed to improve your teaching skills as you work with kids ages 10 and under. We encourage all volunteers who want to help us by coaching to create an account and take the free online Coach Youth Tennis Program. Step 1: Read the Youth Protection Policies and Procedures for USTA Jr. Team Tennis. Click here to download. Step 2: Complete the online training module. You will be prompted to create an account. Depending on your knowledge and skillset, the training will take you 30-35 minutes to complete. If you are unable to complete the training at one time, you can return and continue using the account you created. To get started, click here. i. Ensure a safe, secure environment for participants to compete and continue to develop and enhance their skills. In the application, you will be required to certify and affirm that you have successfully completed (i) and (ii) above. The USTA has retained the services of an independent third party, the National Center for Safety Initiatives (NCSI), to conduct background screenings of all applicants. You can begin your background screen through NCSI here. Once you submit your application, you will receive your NCSI Applicant ID number on the screen. You will use this number to check the status of your background screen (see (a) below) as well as when you login to TennisLink for the first time. a) Once you have submitted your background screen information, results will be generated in approximately 10 business days. Please be sure to add ncsisafe.com to your accepted email domain list. Watch for an email from Compliance@ncsisafe.com in the days following your application; this will also contain your NCSI Applicant ID number which can be used to check the status of your application on NCSI’s website. b) NCSI may contact you within the 10 business day waiting period to request more information. You can confirm the legitimacy of the request by checking your status on NCSI’s website using the NCSI Applicant ID number; your status will note the same request for information. Please watch for communications from NCSI as these emails may end up in your "spam" folder. c) When your screen is complete you will receive either a green or red light, based on the results of your application and the USTA’s criteria. If you receive a green light, you will receive an email from the USTA notifying you that you’ve been cleared through Safe Play with instructions on what to do next. You also will be listed on the results page of USTA.com. If you received a red light, you will be notified by NCSI of your status and you will not be eligible to participate in Jr. Team Tennis. d) Click here for more information and FAQ’s. please contact our COO/Program Manager, Chris Brooks, at C.Brooks@AsAndAces.org. please contact us at Administration@AsAndAces.org.